3D printing has a wide variety of uses. Users can create anything from jewelry and puzzle pieces to architectural models and cookie cutters. Prints can range from artistic to functional, all based on the user’s creativity and needs. Staff in the library’s public Computer Center will work with patrons to find and select 3-D design files from a variety of sources and to upload the file to the printer which uses PLA (Polylactic Acid) Filament. Many color options are available. Because of anticipated usage, patrons are limited to one printed request per seven days. Printing cost, which includes materials, is $1 per hour. Objects selected must take less than four hours to print, so that the print job will be completed during business hours. 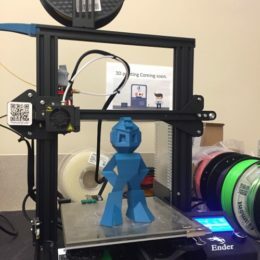 No one will be permitted to use the library’s 3D printer to create material that is prohibited by local, state, or federal law, is unsafe or harmful or poses an immediate threat to the well-being of others (gun parts) or obscene or otherwise inappropriate for the library environment. Please review the 3D Printing Policy for further guidelines and access to the printing request form. For more information, contact the Computer Center at 330-832-9831, ext. 327. 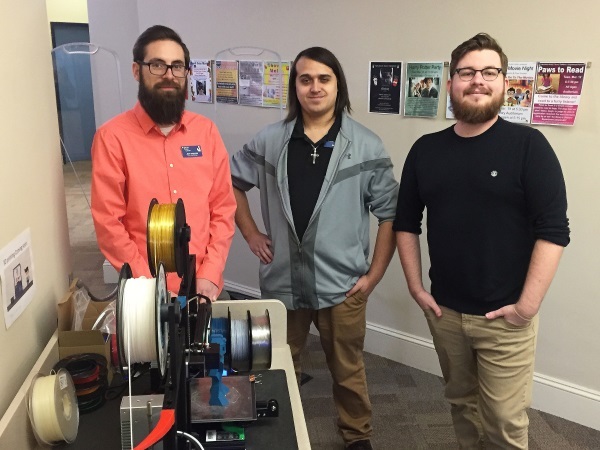 Technology Manager Jeff Kreger, Computer Center Assistant Zach Ainsworth, and Technology Specialist Tommy Beck with the library’s new 3D printer.